I don’t know about you, but constant dinging from my computer drives me rather, well, dingy. 🙂 If you want to have better control of the system and notification sounds on your Windows 10 PC, here are two areas you need to check. This is where you can control most of your system’s built-in sounds, like errors and device connections. The Volume icon is on your status bar. If you don’t see it, you may need to click the up arrow beside all your program icons to access it. Right-click the Volume icon and choose Sounds from the pop-up menu. The dialog that comes up gives you dozens of individual features that you can set a specific sound for with a test button so you’ll know exactly what you’ll hear, or you can turn them off altogether. You can also save a custom sound theme here. 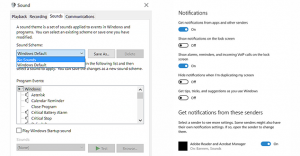 This is where you can control notifications from different apps on your computer, both Microsoft’s own apps and third-party ones. Click the Windows icon and start typing “Notifications” and click Notifications & Actions Settings from the search results. On the Notifications screen, you can turn notifications on or off globally, or set them for individual features and apps.